We at MRG know that building a robot yourself and entering it in the games is a great experience, but we, and our sponsors, would like to hear from former contestants about how your experiences have influenced you. For instance, one former contestant was so inspired by competing in the Games that he went on to Red River College to study electronics and then worked at Manitoba Hydro. He even volunteered on the MRG executive committee for several years. Please, tell us your story. 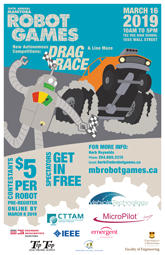 Send an email to ian@mbrobotgames.ca with “Tell us your Story” in the subject line.